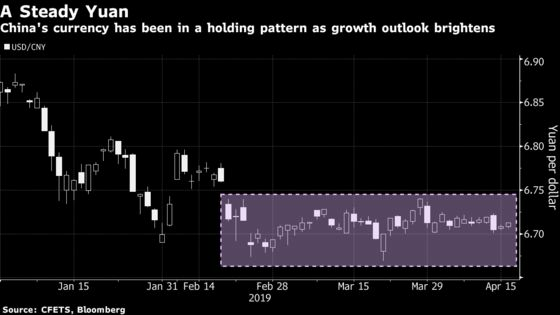 (Bloomberg) -- Capitalizing on improving Chinese growth while side-stepping onshore yuan risk is a foreign-exchange quandary to which the Australian dollar may be the answer. That’s the view of Goldman Sachs Group Inc.’s Zach Pandl, who says investors should go long the Aussie versus the New Zealand dollar, the Canadian dollar or the South African rand. Those crosses provide optimal exposure to Chinese growth with low sensitivity to commodity prices or risk sentiment, he says. The onshore yuan is hampered by ongoing U.S.-China trade talks and China’s policy to keep the exchange rate stable. Meanwhile, the Chinese economy, the world’s second-largest, is showing signs of recovery in the housing market, credit growth and consumption. Industrial production and retail sales data slated for release Wednesday may add to the bullish case, even as the consensus is for gross domestic product to slow. Australia, New Zealand, Chile, Peru and South Africa offer above-average exposure to Chinese growth, but limited exposure to the yuan, Pandl said in a note. When played versus the U.S. dollar, or on crosses, the currencies “could be better options in a higher China growth/flat yuan scenario, which has been the case lately,” he wrote. The open economies in Asia and their currencies “would likely perform well if Chinese growth picked up and the yuan appreciated, but might disappoint if the CNY remains range bound,” he added.